Map of Evacuation area (not of the wildfire). Credit: Grant County Sheriff’s Office. 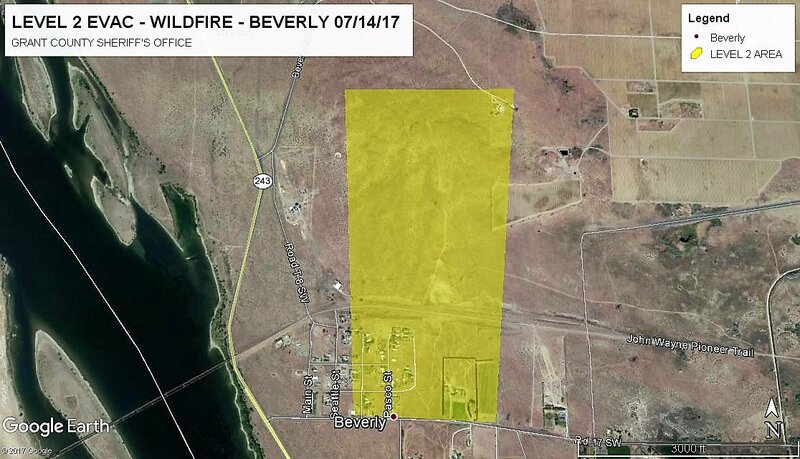 Fire crews were dispatched at 1748 hours on Friday evening (7/14/2017) to a grass fire burning about 10 miles North of Mattawa (Grant County), Washington State. It is also appears to be burning near the town of Beverly since there is a Level 2 Evacuation order in effect. The fire has consumed 50 acres. Fire crews have reached a 75% containment status. Fire resources from 6 local (unknown) Fire Districts and the USFW are assisting. Command is under the Grant County Fire Chief. ← #CottonwoodFire | Washington State | New!